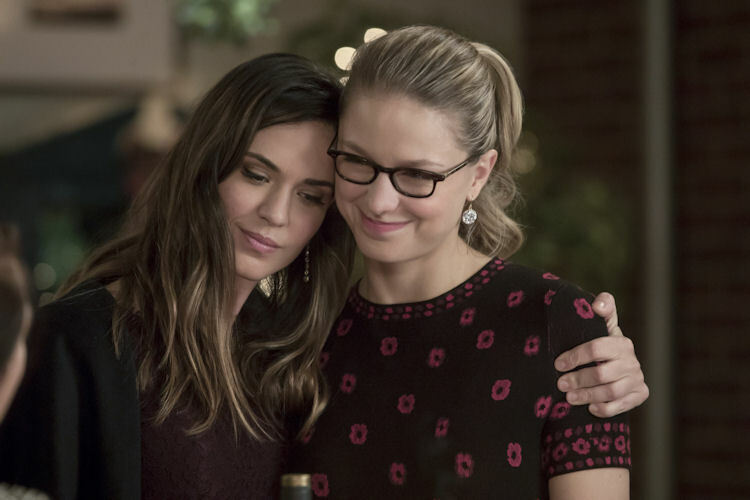 What’s the scoop: There’s a new threat in town, and it’s screwing up Kara’s Christmas party. It appears to be burning a Kryptonian symbol into everything in an attempt to draw Supergirl out. Kara’s not-mom hologram doesn’t know anything, but the creepy cult leader from a few episodes back knows the whole tale of the coming of the Worldkiller. Tired of playing cat and mouse, Kara burns a symbol of her own in the hopes of drawing out a new foe. Meanwhile in B Plot Land: There are lots of little character points spread around the episode. J’onn’s father enjoys Christ, but needs Winns help to catch up on pop culture references. Mystery Single Mom Samantha is losing big chunks of time lately. Mon-El and his wife fill everyone in on what has happened the past seven years he’s experienced. Kara is pleased that she serves as an inspiration for a Legion of Superheroes, but still has trouble seeing Mon-El play kissy face with his bride. 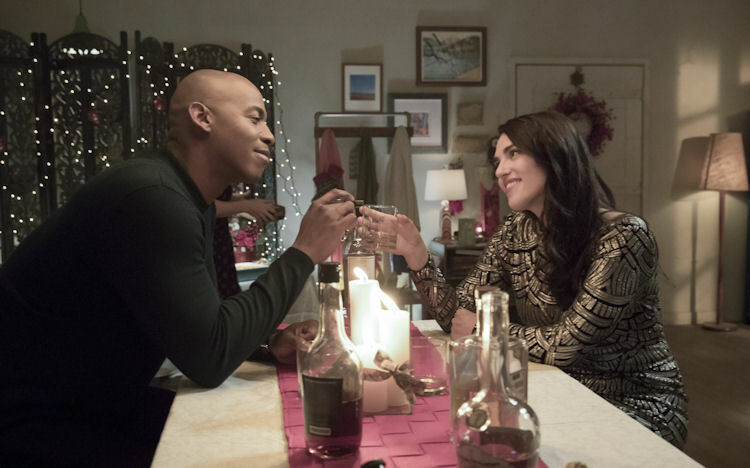 Calling Human Resources: Speaking of Kara’s ex-boyfriends, sparks start to fly between Jimmy and Lena Luthor. Both Kara and Samantha sanction this coupling, and Jimmy saves Lena from an assassination attempt. This relationship becomes the stuff of HR nightmares when Jimmy and Lena have a drink in the office, then proceed to make out. 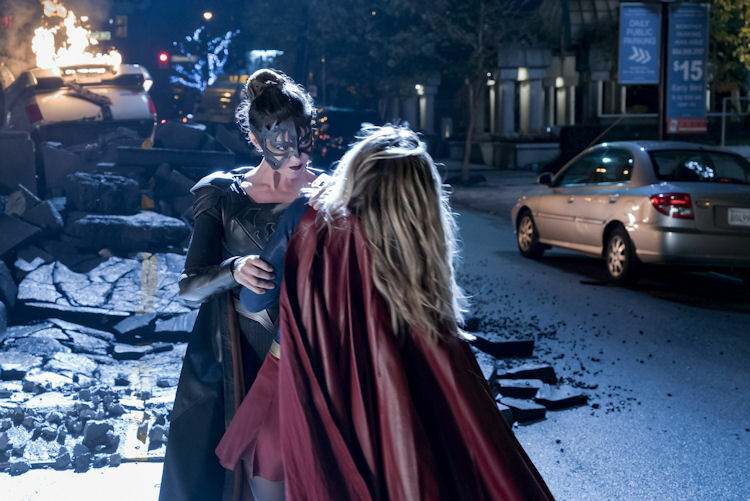 What about the action: Without the need to help back something bigger, Supergirl turns in its most action-packed episode of the season, outside the crossover. There’s some interesting sequences shot from Reign’s POV as she dispenses her idea of justice to crooks around town. That serves as mere appetizer to the most brutal fight from the series, so far. Kara has fought Kryptonians before, but none as savage as Reign. It’s a down and dirty fight that sees Kara battered, bloodied, and dropped off the side of a building. What’s next: Things look as bleak for Kara as they’ve ever been. However, Kara will have lots of help defeating Reign thanks to her normal support from her DEO cohorts, but you’d have to think Mon-El would wake up the rest of the Legion to help take out this new threat. Of course, it will be especially tough on Kara when she discovers her new enemy is also her newest bestie. Last impressions: This was one of the most well-balanced episodes of the season. There were bits of fun like Ruby wanting to hear Supergirl stories from Alex or J’onn and his father together. There was Lena breaking Tumblr’s hearts by hooking up with a dude. It was all capped off with the first round of what would be some epic Kryptonian vs. Kryptonian battles on the show. All in all, this was definitely a high note on which to go into the midseason break.